Tension Testing, also known as Tensile Testing, is a simple method to determine several key properties of materials. The test is performed by using a test frame to pull specimens apart in a single axial direction. These test specimens are machined to one of a variety of different standard sizes based of the material thickness and configuration. Samples are machined in a smoothed shape similar to a dog’s bone; the wider ends provide ample to grip the sample, while the narrower machined center provides a reliable location for the sample to ultimately fail at. Tensile Testing provides key engineering properties including Yield Point/Yield Strength, Tensile Strength, and Elongation. Tensile Testing can also allow calculation of Young’s Modulus, Poisson’s Ratio, Reduction of Area and any strain hardening characteristics. Yield Point/Yield Strength is the point at which the material experiences enough stress that if it was released it would not return to its original dimensions: effectively it has been permanently stretched. Often designers view any permanent deformation to their part as a failure, therefore this is a key testing parameter. With most materials, the material will actually become stronger as it is deformed and pulled by the test frame. Tensile Strength is the greatest force that the test frame reads before the sample fractures. The third result from Tensile Testing is the Elongation that the material exhibits. This is measured by initially marking a set distance on the sample before testing (generally 2”) and then measuring those two points after the sample has fractured. This percentage is used as a quick means to compare materials and their capability of being bent/formed after the test. Young’s Modulus can also be determined by the comparison of the rate of deformation to the strain before the material begins to permanently deform. This is a measure of the “stiffness” of the material. This is an important as some materials have similar strength characteristics, but one may be significantly less stiff. 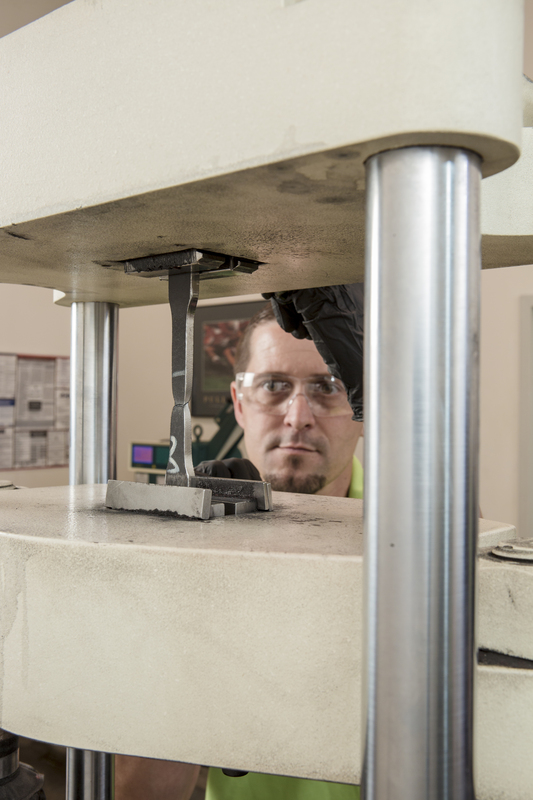 SPS Metallurgical Labs performs round, rectangular, radiused and weld tensile testing to ASTM A370 and ASTM E8, which are the most broadly, recognized tensile testing standards.